Cool monsoon showers often settle the summer dust in the Southwest. They bring relief from the heat providing shade and water for the inhabitants of the desert land. 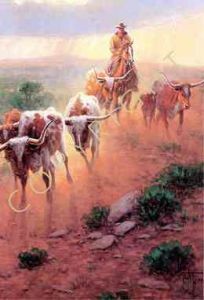 This cowboy gathers his longhorns from the vast countryside as the rain falls below the setting sun. It is a common sight to ride through the Southwest in the company of'Traildust and Raindrops."